Is it Cottage or Shepherd’s Pie? Most people call this dish “Shepherd’s Pie”. Period. FYI… This is cottage pie. This is common fare for us in the winter, and especially in the month of March around St. Patrick’s Day. I know, I know… shouldn’t it have been corned beef and hash? Alas, this is probably where the other parts of my genetic make-up take over. 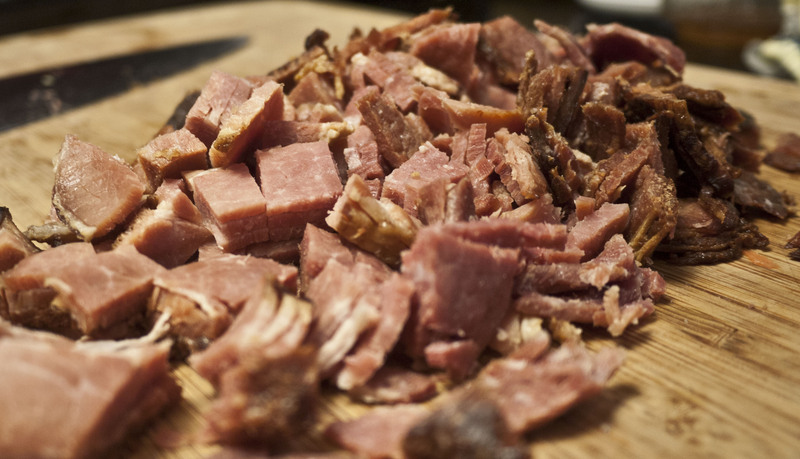 Can’t stand corned beef. 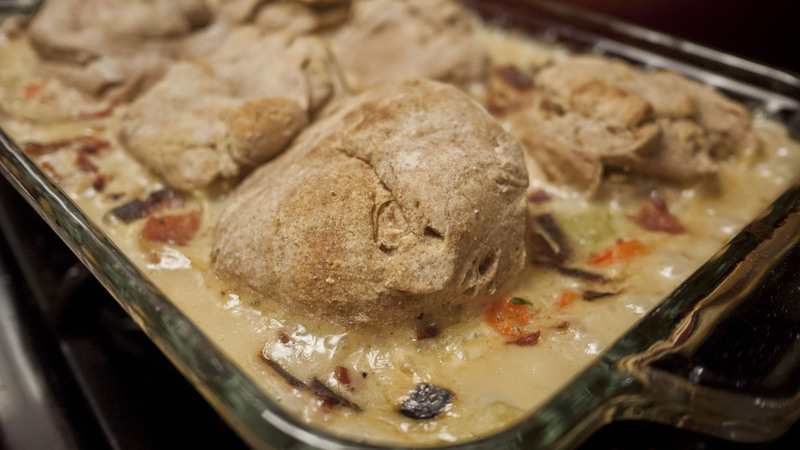 So I this is a classic dish, British-Isles-Ish, that I feel good about eating on March 17th. And yes, I’m late posting it. But I’m making it again in a week or so… so see. You don’t have to only eat it for St. Patrick’s Day. I would argue that “taking it up a notch” doesn’t really keep true to its roots in the British Isles, BUT, it does seem to better appease our American taste buds. Brown your beef and chop your veggies. This is almost always my first step, because I like to use the fat leftover from your beef to saute the veggies… I’m big into waste not, want not. 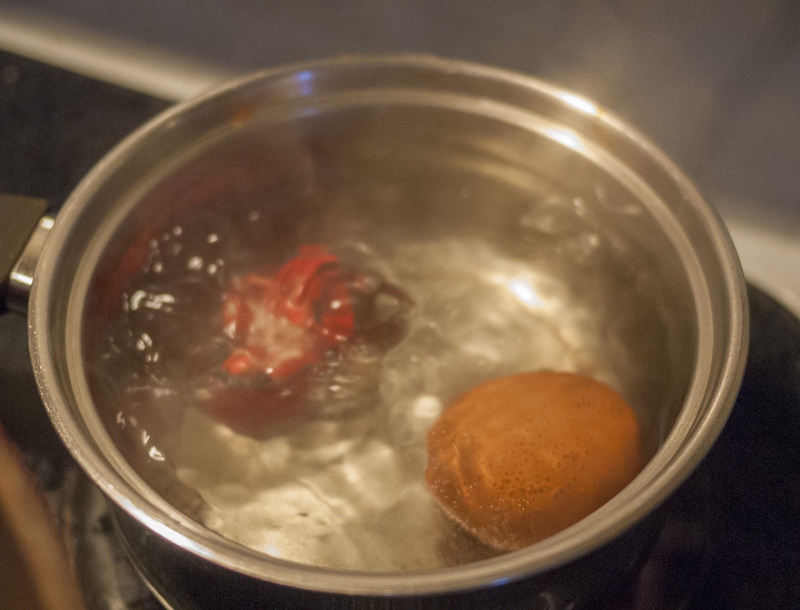 While your beef is browning, bring a pot of water to boil for your potatoes. Once it’s boiling, drop in your peeled chopped potatoes. You are making mashed potatoes to top off the pie. After the beef is browned, use a slotted spoon to remove. If you can do it quickly, you don’t need to reduce to heat (keep the fat simmering). Then, plop in your onions, carrots, sage, and thyme. You may need to add more butter to prevent sticking. After they’ve sauteed for about 5 minutes. Salt and pepper generously, but if you plan to use salted broth for deglazing and/or later in the recipe, just go easy if you don’t like things over salted. Once the onions and carrots are tender, put the beef back in with the onion, carrots and herbs, and splash your whiskey (you can use broth if no whiskey). Use a wooden spoon to scrape up the browned bits at the bottom of your pan. This makes the food divine. I do not joke. Do not skip this step of deglazing! I like to think using whiskey makes it more authentic. I mean, we ARE trying to tie ourselves to Irish, roots, aye? Now add your peas. Fry up for a few minutes until they start to thaw. Add your meat and broth (or water) Bring to a boil and you want to ensure your peas are cooked all the way through if you’re using frozen (which is pretty much what I always do). If you used canned you probably don’t want to cook as long as they don’t turn to complete mush. Once the liquid is reduced some, peas are cooked, dump your veggie beef mix in the largest pan you have. Now, about this time, those potatoes are tender and falling apart in your pot. Strain them, mash ’em up with butter and milk. This is the only tricky part to the recipe: Dollup the potatoes around the beef and then spread it out, as if frosting a cake. Cover your dish and cook for about 20 minutes. Peek at it. If you’re using a clear glass dish, you should see the liquid boiling inside. This is a good sign. Right before putting your beef+veggie mix into the pan, mix in one can of tomato paste. Probably not authentically Irish, but I llllooovvveeee the flavor it adds. After you’ve spread the mashed potatoes on top as described above, sprinkle 1/2 cup cheese on top of the potatoes and then cover. When you remove your cover/lid/foil during the bake process, you can watch the cheese to how melty/brown you like. For THIS time, I added the cheese. We can’t go wrong with cheese in this house. This is what it looks like, pulled out of the oven after a total of 25 minutes (5 uncovered). This is what it looks like served, and about to be devoured, like the true Irish woman I am. I adore potatoes (check out this and this and this if you don’t believe me). I love them sooooo much. So, I love soups. I would eat them every day. I love broth ones, porridge ones, creamy ones. In a box with a fox, in a house with a mouse. My wonderful, long-suffering Italian husband… he’ll eat them. He’s a good sport. But he doesn’t love them. I love Asian food. I’m a military brat who spent a total of 6 years of her childhood on Okinawa (and some other random places, too). I grew up in a home that appreciated this “ethnic” food, and we ate it frequently. My wonderful, long-suffering Italian husband… he’ll eat it. He’s a good sport. But he doesn’t love it. He actually asks for this. 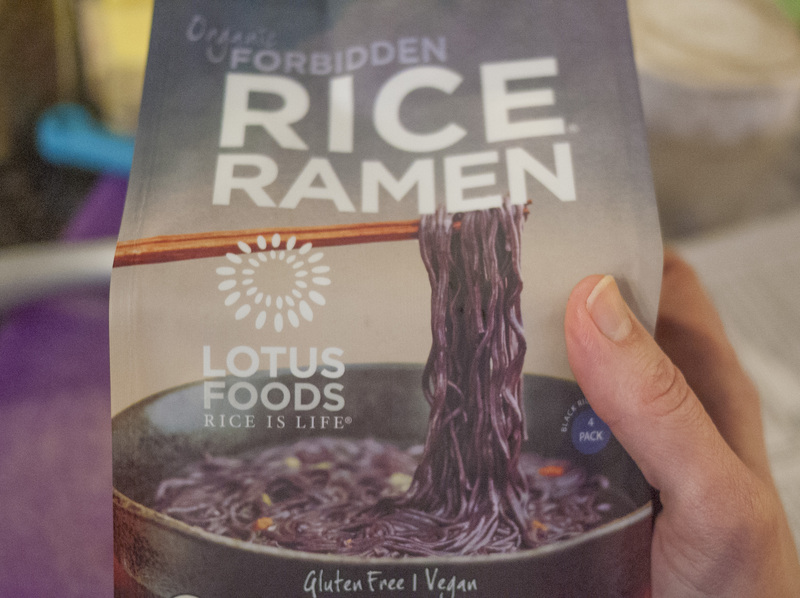 I’m not entirely convinced it’s because it has a pasta-like carb in it ;-) but for us… happy medium when I’m craving Asian and he’s not feeling so tolerable to my other dishes. Like cabbage stir-fry or fried rice. 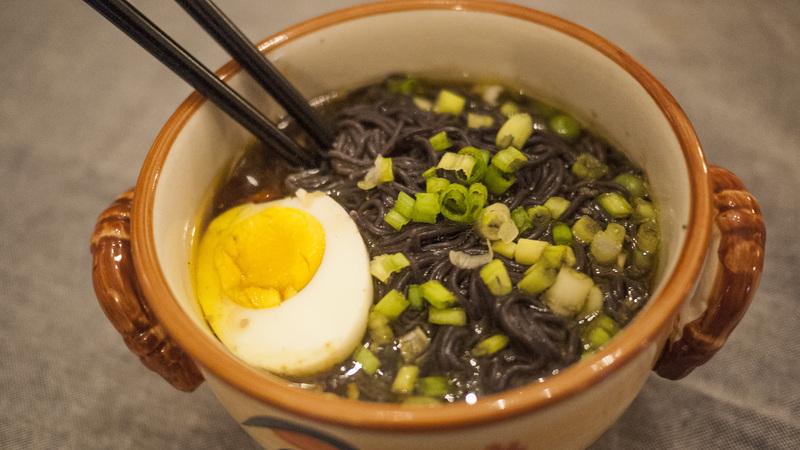 Now, my disclaimer is this: there is probably going to be some ramen purist out there that will claim I didn’t do this the correct way. You’re probably right. There’s likely many restaurants out there that could make this more authentically. However… this foodie is on a budget. With legit health concerns over the food I eat. So I think this is a balanced compromise. 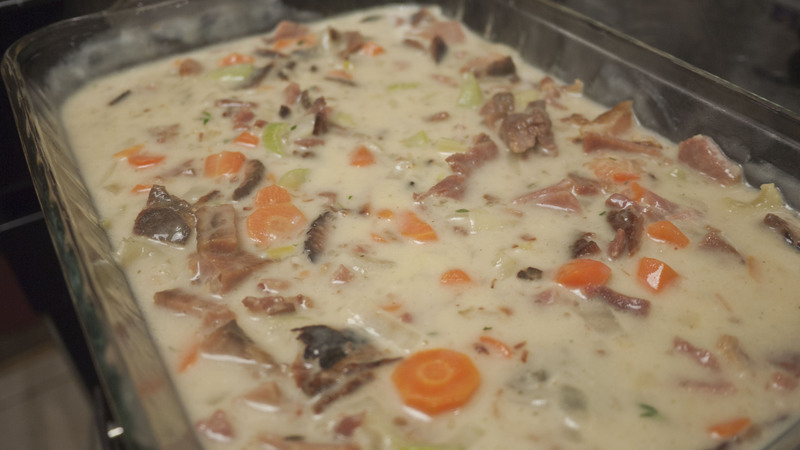 We start this soup like any other soup or stew-like food, like my chicken soup, chili, or even stroganoff – frying the onions in butter. You can create no better base than this! 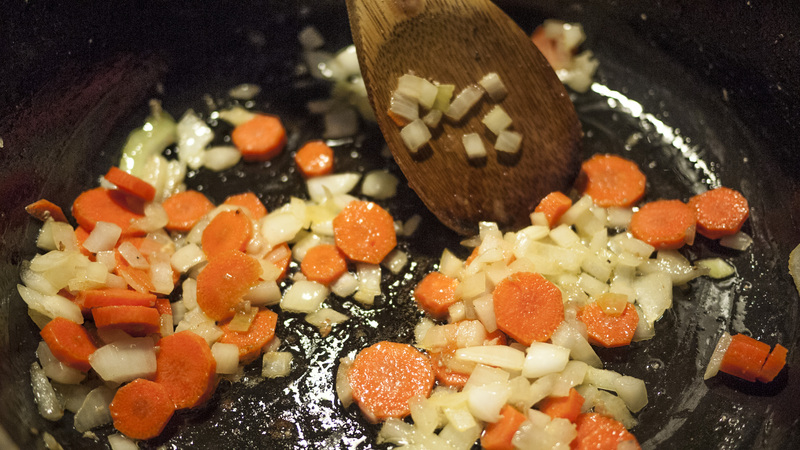 diced carrots, mushrooms… lots of topping ideas. We usually stick to green onions, but if you know you have a favorite asian topping, I promise you can add it and it will be fine! Do your thing with the butter, onions and carrots. I would recommend using a big pot or dutch oven. Also, side note, this smells like heaven. If you were slightly hungry before starting, now you’re likely salivating. Remove the vegetables (I use a slotted spoon) once they are softened (they don’t have to be mushy… you’re going to boil it later) and brown the the ground pork. DO NOT SALT IT. 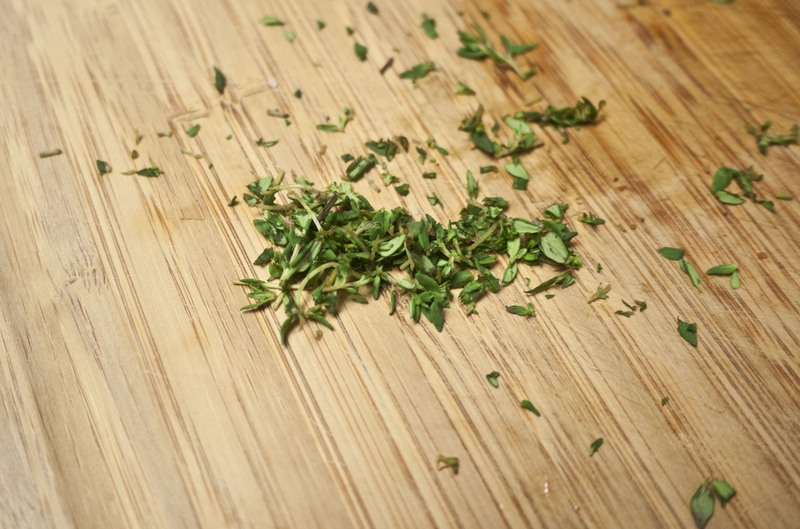 If you’re a home cook and you’ve done browning meat any length of time, a lot of recipes call for salting it. You will regret it because of that soy sauce that’s coming on later. However, feel free to go nuts with the pepper. The soup can be as spicy or peppery as you want, so do this as what you feel is appropriate for your tastes. Now that the pork is browned, add the veggies back in. Sprinkle on the ginger and red pepper flakes. Stir and let it saute for just a minute. Now you may add the soy sauce. Use the soy sauce to scrape up the browned bits stuck to the bottom of the pot … this is also called deglazing. You want the brown bits because it adds flavor. I promise it’s true, because the depth is not as great if you tried to clean it off (and not use it) and then continue cooking with a clean pot. Add your water. 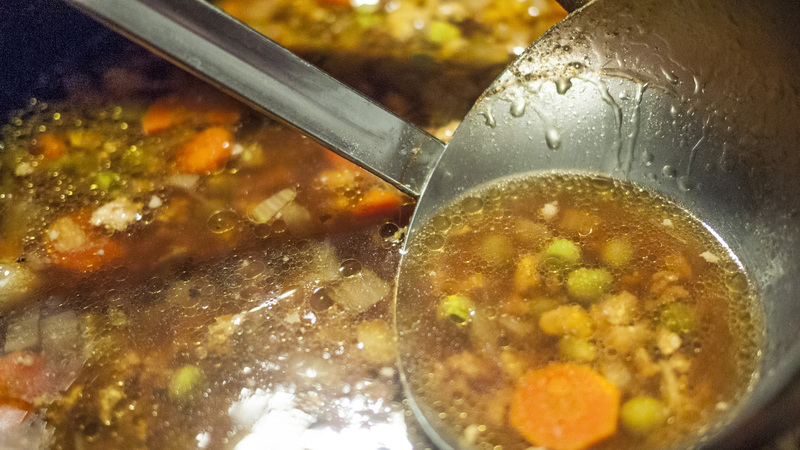 You could use broth… wouldn’t hurt. However, if it’s salted you might run into issues make the soup too salty. 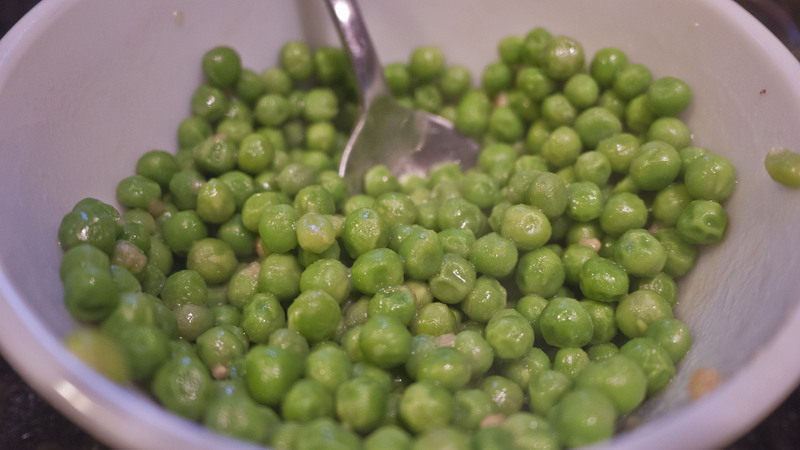 Throw in your peas if you’re using … and begin the boil. 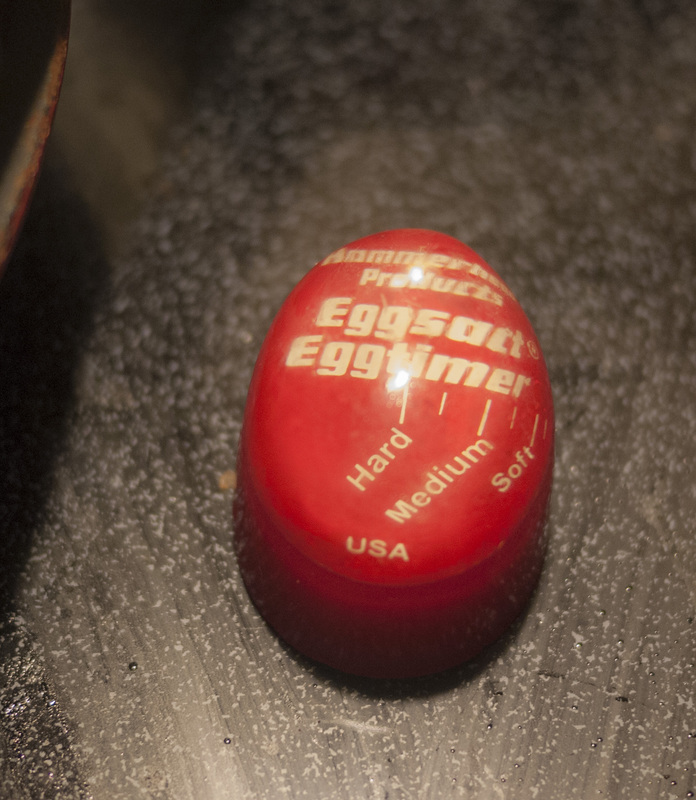 I know there are guides out there for how to boil eggs. I just use this sucker (check it out here). Love it. Had it for years and it was a cheapy kitchen spontaneous buy. You want to boil the soup for about 10 minutes, (this is about cooking the veggies the rest of the way), then let it simmer for another 15 minutes or so. Just honestly, you could rush this. Or draw it out. Whatever you are working with in time. 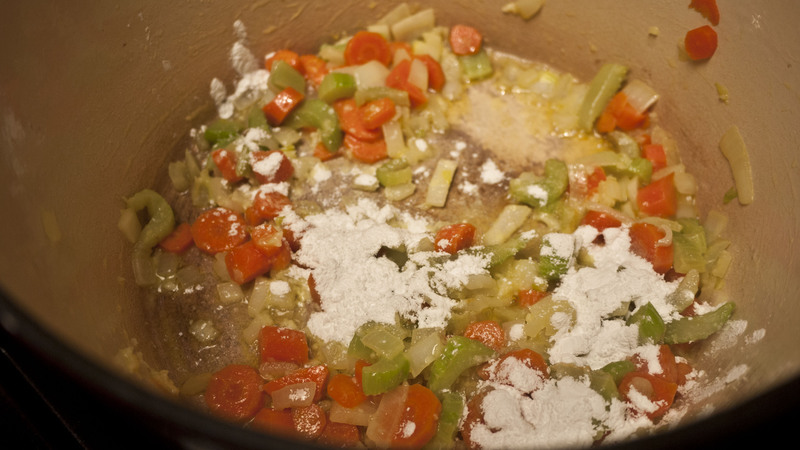 I wouldn’t recommend letting it simmer for an hour or anything… I think the peas and carrots would go to mush. Unless you like that kind of thing… then knock yourself out. 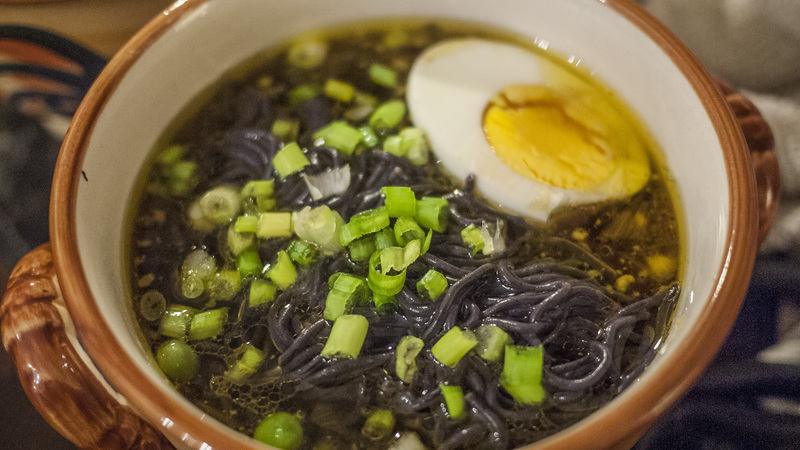 Now here’s how it’s going to vary… prepping whatever ramen you’re using. I use gluten-free ramen noodles. I’m still not over this… my ITALIAN HUSBAND LOVES THESE THINGS. 1) They’re Asian and 2) they’re rice (not wheat). My noodles call for me to boil them for a very short amount of time, then run then under cold water. I just have to tell you… if you buy them and they say to run it under cold water…. DON’T SKIP IT. It prevents them from cooking further and not turning gross and mushy. The benefit of the soup still simmering is that once I drop the noodles in, it rewarms them! It works beautifully. And then… top it. That egg, y’all. THAT EGG. 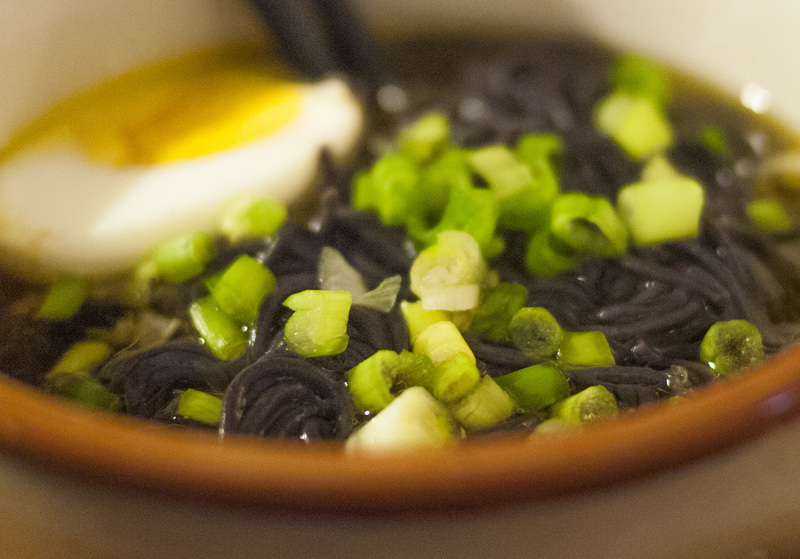 And those scallions. I really wouldn’t skip these garnishes! Isn’t this soup great and forgiving? it really is what you want it to be. Maybe that’s why my Italian husband loves it, too. DISCLOSURE: There may be affiliate links within this post. I never recommend anything arbitrarily and receive small financial benefit. If I choose to recommend something, it’s of my own free will and volition and MORE because I think you’ll benefit from hearing about it more than me gaining the $$. This is becoming one of my favorite side dishes because it’s easy to turn it into a filling meal. You have a starch, vegetables, a little bit of protein, and it’s very easy to add more – cook your shrimp, chicken breast, etc. before you start the process and BINGO! A balanced meal. I think I also like it because you can prep this stuff in advance… you can cook the egg, thaw the peas, cook the rice. Night of, really… you just throw it all in a pan, and presto! Unless you’re my husband and this is just enough as a main dish. What can I say… I married a steak-and-potatoes kind of guy. (Well, really, a ravioli and meatballs kind of guy, but that’s another story for another day.) However, this often “does it” for my lunch — I rarely need to add much more to this. Needless to say, it reheats well, and I often make a large batch and just munch on it throughout the week. There are two variations, sticky or mushy. Really, depends on your preference. I happen to be a mush-food-loving-girl so that’s often how I fix it. What changes it? If your peas are fresh/thawed or still frozen when you throw them in the pan. 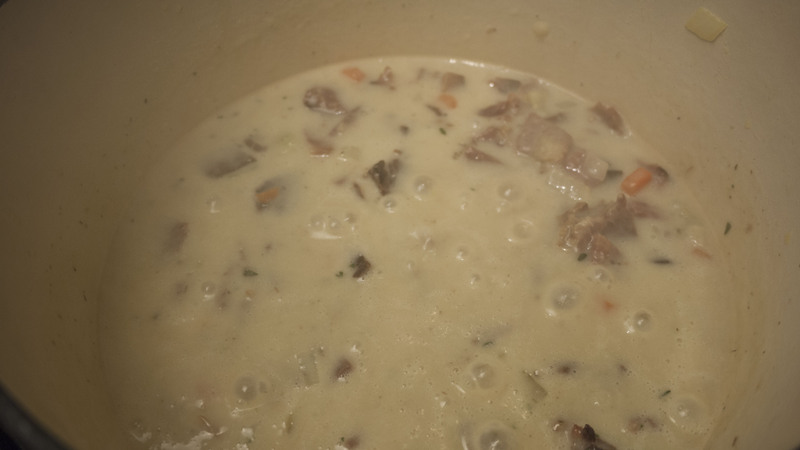 Throwing them in frozen means you’re going to get water added back to the dish, making it slightly more “mushy”. 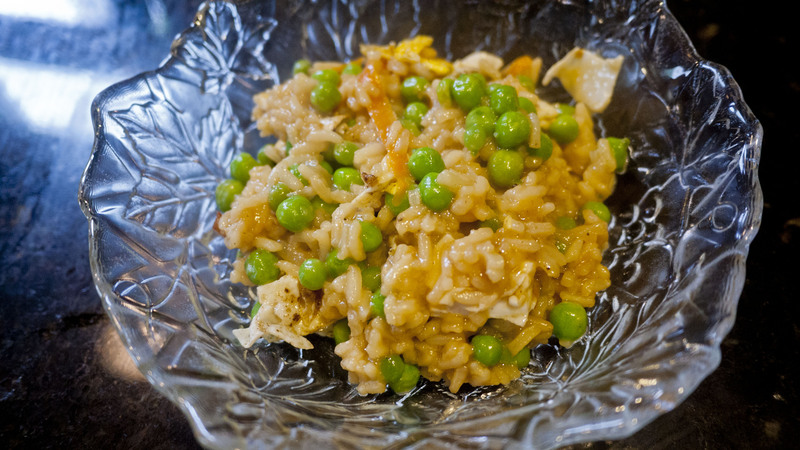 If you like sticky fried rice, make sure your peas have no excess water. I would like to add that I use white rice, and that has to do with the phytic acid content being found in the bran that makes rice “brown rice”. Granted, brown rice adds more fiber, but I’m not particularly interested in wasting all the nutrition in the rest of my meal on the phytic acid in the bran. So, white rice for me. Heat your skillet and add the butter. 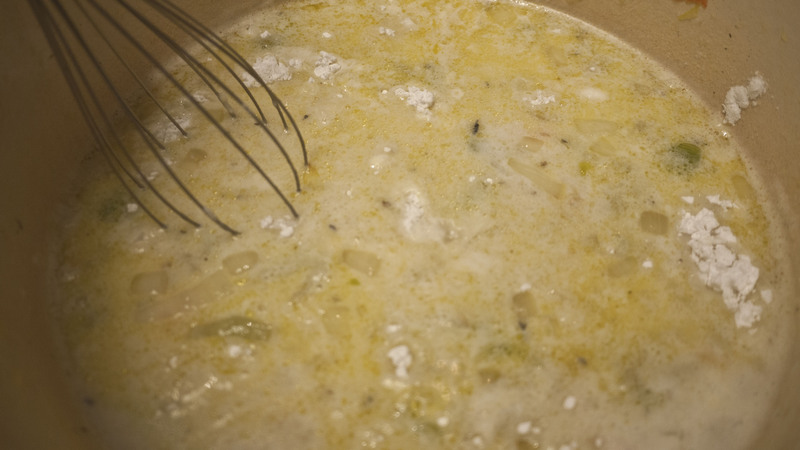 You may need to add more butter as you cook if the food starts to stick, so have some around/ready. Add those onions and carrots and cook! 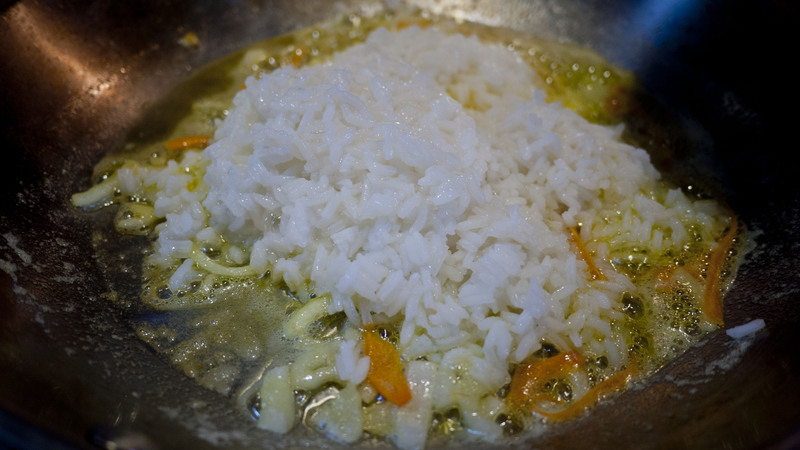 Once the onions have started to become translucent, add all the rice and fry it in that yummo butter. Watch for the rice sticking to the bottom – may need to add more butter! 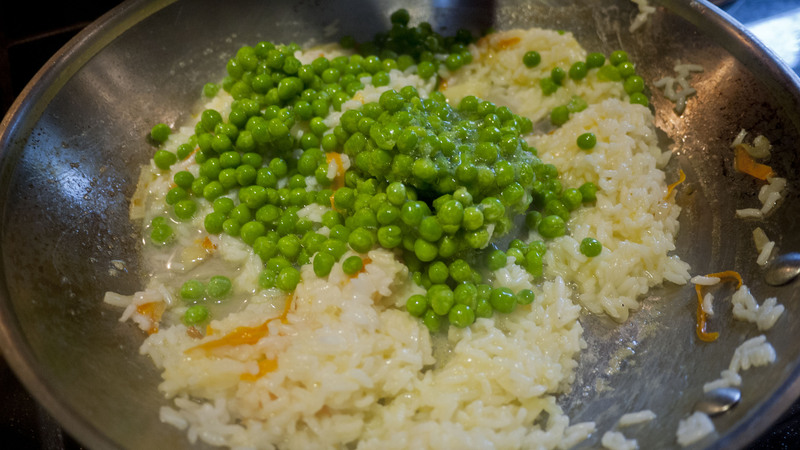 Once it is thoroughly mixed, dump the peas in. Notice mine are frozen (if you look carefully you can see the ice). If you’re using frozen rice, you’ll need to keep the heat on medium, and I recommend covering it with a lid to help it melt faster. You can move to the next step once it’s all melted and mixed in. If you’re using fresh/thawed, just stir until combined. 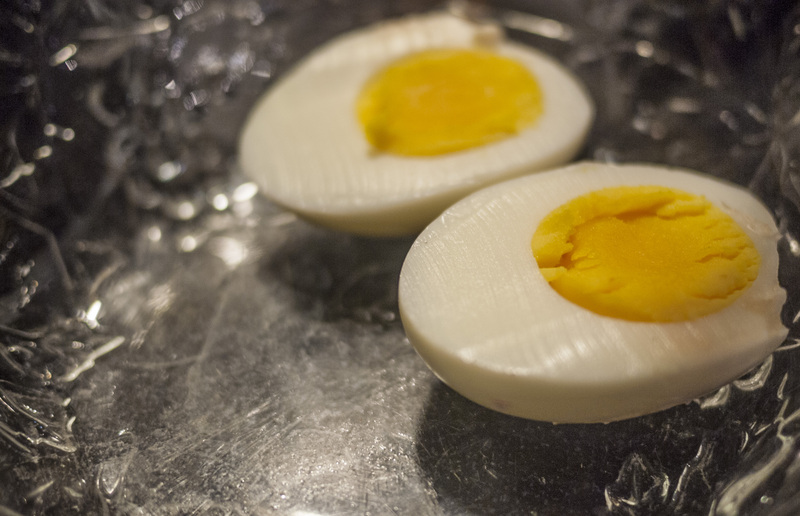 Mix in your fried egg, and voila! Fried r ice! At this point in the winter I get so. sick. of. frozen. vegetables. I will, on occasion, buy fresh ones (and I am a sucker for roasted carrots all winter long!) and eat a salad, too. However, a) they never last long, and often spoil before I can eat it all and b) are usually MUCH more expensive than in the spring/summer/fall. Alas, it’s frozen veggies for me. Need something just a little *different* with your peas? Try to onion-them-up with this cheap, easy, and fast trick. Melt 2 tablespoons of unsalted butter, adding 1 teaspoon of onion powder, 1/2 teaspoon of dried minced onion, 1/2 teaspoon of salt. 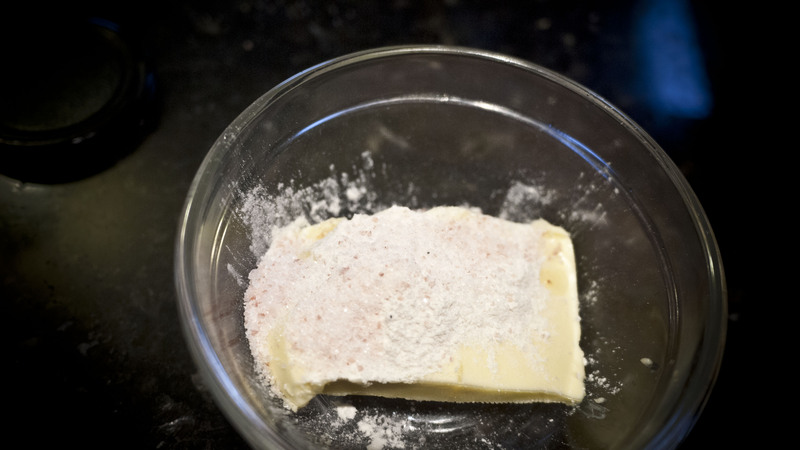 (You can do this with this with salted butter, just don’t add in any salt.) Mix it well with a fork after melted. Stir the butter mixture with 2 cups of already cooked/prepared peas and you have it! Seriously, I could eat the whole two cups on my own! I’m not complaining about eating my peas any longer. This was born out a desperation for comfort food. Earlier this month, we got hammered with snow storm after snow storm… I wanted to crawl up in a blanket, drink my coffee, and eat comfort food. Which, for a real-food foodie, is not as easy as it sounds. 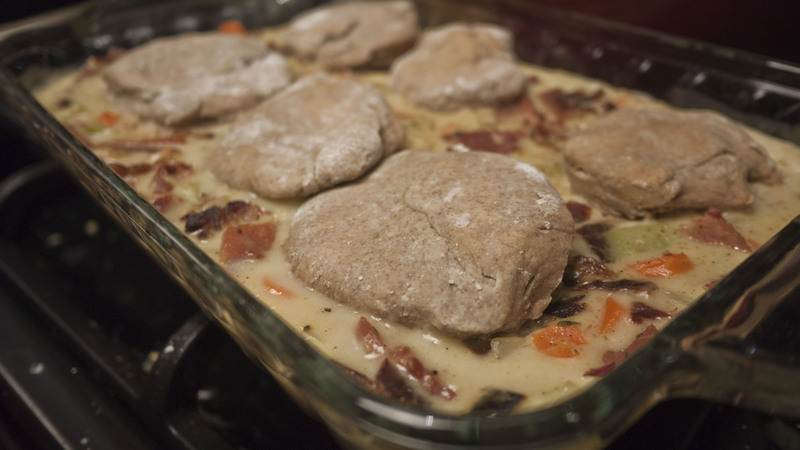 This recipe was inspired by this Biscuit Pot Pie from another blogger, but I changed it up a bit to exclude unsprouted/unsoaked wheat… and to use up my leftover Christmas ham that’s been freezin’ away. Y’all, these are the BASICS of eating real food. It’s exchanging the fake/unhealthy food for the good stuff God made for your body (a.k.a. “real food”). Prep your biscuits. The recipe I use regularly is from The Elliott Homestead. I make these, on average, about every 10 days. I do this as it reduces the amount of snacking/eating the processed stuff I do allow (like cereal). When they can grab a warm biscuit with healthier wheat, grass-fed butter, and topped with raw honey… it’s now a health-food. So I usually plan to make the potpie close to the day I’m going to make biscuits. The reason that it’s so important to plan this out is that these biscuits take a little thinking ahead — you have to set the dough for soaking 24 hours before you can bake them. This is not complicated, do not be overwhelmed! I basically spend 5 minutes at about 7 at night to prep the biscuits, then finish the prep the next morning at 7 a.m. (I usually double the batch.) I would bake all but six of them in the morning (which is what I did today), and save those six to top my pie tonight. Another *think ahead* step: I usually buy organic celery, chop it up, then freeze it. Since I do not ever want to eat it raw (sorry, YUCK! ), but just cook with it, it’s so much less expensive… I can use a small amount and not waste the rest or feel obligated to eat it (again, YUCK!). Melt your butter in a large pot/pan. 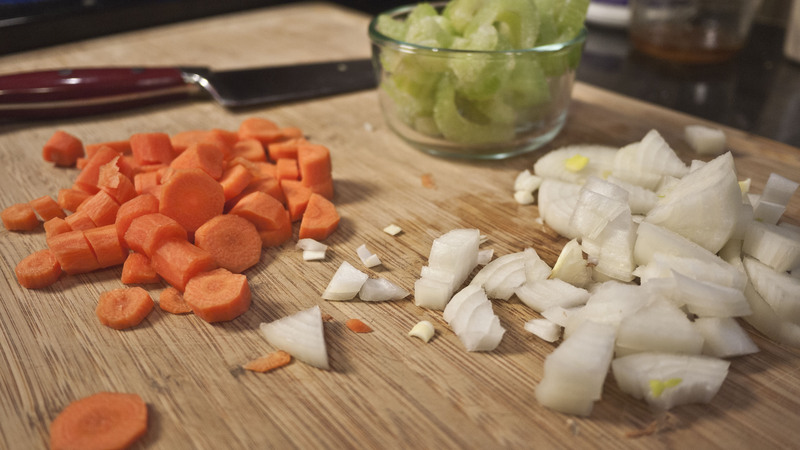 Once it’s melted, begin to saute the carrots, celery, and onion. Saute these vegetables for 5-10 minutes, and they will start to become fragrant. Once the veggies are starting to cook and lose their color (they look duller), add the pressed garlic. 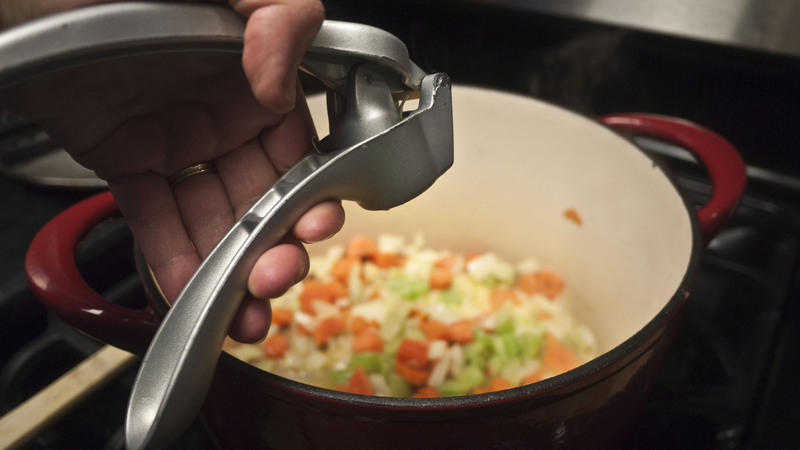 You can do this however, but I have a garlic press. Let this cook for another minute or two until you smell that garlic. Garlic cooks quick (and consequently burns) so you don’t want this to sit long. Once you smell the garlic, throw 1 tablespoon of arrowroot powder and stir. This is the beginning part of the thickening process. 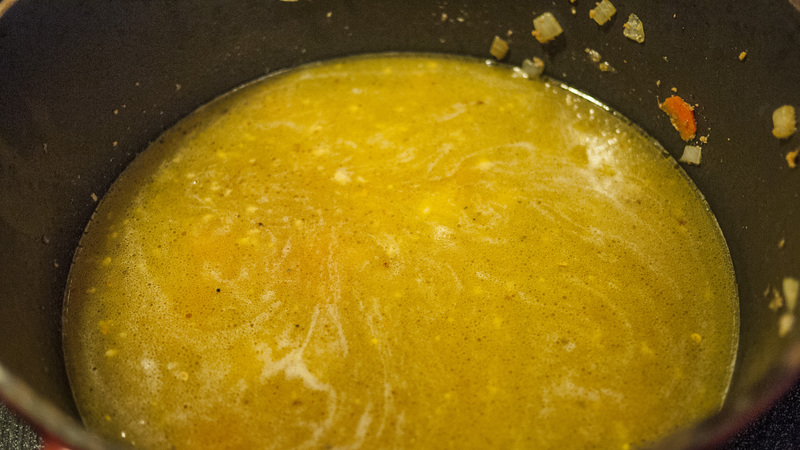 Still stirring, add your 2 cups of chicken broth. Continue to stir for a minute or two until it’s all combined. I would also suggest scraping the bottom of the pan with a wooden spoon (the browned bits on the bottom are part of what makes it delicious!). After its scraped, add your 1 cup of milk and stir. Whisk in the remaining arrowroot powder (1/4 c). Keep whisking until it’s mixed well. Bring this mix to a boil, and let it boil for about 5-10 minutes until it’s thickened significantly. Add your chopped ham, chopped thyme, and peas, and stir. Put the lid on and let this cook at a slow boil for another 10 minutes. When you uncover it, it will be thick and combined. Dump into a casserole dish, and sprinkle with black pepper. Bake this for about 10 minutes at 400 degrees. It will be slightly browned when you pull it out. Top this with your uncooked biscuits. You can put as many as you want on top, but just be aware that they tighter they are squished into the dish, the longer it will take to cook them through. I usually space 6-8 out over the dish, and that’s because I don’t want heavy bread at night-dinner. Put this dish back in your over, and cook for another 10-15 minutes, until your biscuits are cooked through and the tops are browned. If you pull up a biscuit, you might notice it looks gooey on the bottom — and this is because it’s been sitting in thickened soup, basically. If you’re concerned about the doneness, break a biscuit apart and examine the contents in the middle for how well it’s cooked. Let it cool for 5-10 minutes, so it won’t burn your mouth. What we write the most about!